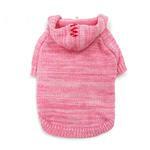 The Hoodie Sweater Dog Coat by Dogo in Pink is a sweet sweater for your dog! 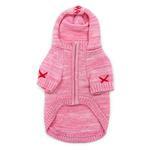 Hoodie Sweater Dog Coat by Dogo - Pink Customer Photos - Send us your photo! Strawberry is a big Boston who loves it when she can prance after squirrels in warm jackets that give her the freedom to jump and chase. Ava is our 6 month old little angel. She loves her new hoodie and enjoys wearing it. It fits well and she looks great in it. Posted On 02/03/19 by Korena S from King City , OR Yes, Korena S recommends this product! I absolutely love this sweater on my cocker spaniel. The zipper detail and stitching sets DOGO apart from other brands. We love their products!!! Awesome quality! Our girl loves it!! Posted On 01/22/19 by Susan H from Fullerton , CA Yes, Susan H recommends this product! Awesome quality! Our girl loves it! !- soft to the touch. Posted On 10/24/17 by shundale b from Hope mills, NC Yes, shundale b recommends this product! Really cute, good fit went by size recommended! Posted On 09/09/17 by Abigail L from Coeur d'Alene, ID Yes, Abigail L recommends this product! Absolutely love this sweater! It's very warm for these cold winter days, fits her great and she loves to wear it! Posted On 01/12/17 by Elaine H from Roxboro, NC Yes, Elaine H recommends this product! Just received this item for my sweet Emma. Love the hoodie sweater and it just looks adorable on her. I bought this sweater for my yorkie and she loves it! she is not considered a tea cup but she is really small (3.6 lbs) I followed the measurement suggestions and the XS fit her perfectly. The quality of the sweater is great as well as the price :-) She looks so sassy on her new outfit and I love it. Thanks Baxterboo for the amazing service and product selection. Posted On 10/22/16 by Y. C. from , CA Yes, Y. C. recommends this product! This sweater is so cute. Tried it on my Chihuahua and it fit her just perfect. Love the pink color. Highly recommend this sweater for your fur baby.